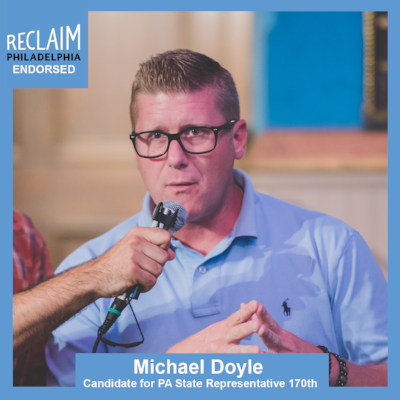 Questionnaire Responses by Mike Doyle — Candidate for State Rep in the 170th. 1. What do you value most about the 170th district and why do you want to represent it in the state legislature? I have come to know this district in various and profound ways since I first moved here 14 years ago. We initially choose to move here as a matter of convenience. My wife was working in the city and public transportation was very accessible and I ran my own business as a Realtor and found the location to be conducive to traveling throughout the five county area. Over time however this neighborhood came to mean a great deal more. As a community, the district was there for me when I needed a community the most. As a person who suffers from substance abuse disorder I came to understand that community and the unconditional love I received from those within it who were willing to offer help and a fellowship of others that were also in recovery from alcohol and drugs. When this awakening happened I also came to understand that it took a community of neighbors, not necessarily from the same walks of life, to help each other get through the good times and the bad. I soon realized that, even though I did not feel a part of the community initially, that this unbreakable bond that began to grow between myself and others in it made me a part of. However, after the 2016 election I came to know many people that I grew to love and respect that had obvious and apparent differences when it came to politics. Initially I choose to ignore these realities, and my wife also found herself dismayed. We even discussed moving because of our perceived tone of the neighborhood and then someone said to me that I was possibly put here to be the “other” voice. And if I left, who would be there to offer another opinion when these conversations came about at the diner or in the parking lots after a fellowship meeting. I reflected and realized that the one thing that brought me close, and made me a part of the district was my bond of recovery. I began to understand that, even though someone in my neighborhood may have voted for a person I could not ever support, I had a responsibility as a neighbor to be there if they were to ever reach out for help. Leading up to the current campaign season and realizing there was no other candidate at the time, I looked at my wife and said “this community gave us our life back. The least I could do is serve and maybe help others in a larger way get theirs back. Throughout the canvassing in this district I have come to know many mothers, brothers, sisters, fathers, etc. that are lost because they either have a loved one that is suffering from substance abuse disorder or have recently lost a loved one to the opioid epidemic. I want to represent these families and many others and let them know hope exists and that I will always fight for them. Because I am a part of their community. I feel as though the impetus for me being in the position I am in right now is due to my recovery and the need for me to give back to my community to keep what I have. A cup of coffee and a conversation is truly grassroots, and the deep conversations I am having has the ability to create a movement of compassion and bring our community together. Ensuring that many of the issues that are important to me are shared with the district through monthly town halls. Inviting other groups, that may never have thought of even coming up to my neck of the woods, and explaining why other issues are important for them is also important. I feel that the community will grow over time to understand the need for all of us in our district to unite together with others in similar economic circumstances that may be of a different race or ethnicity, in order to preserve our rights and fight against the corporate plutocracy that really tries to rule our country. I have not served as an elected official before. I would like to be able to deliver friendly and outstanding constituent services that go above and beyond the normal expectations of the current representative. I feel that the needs of our community are indeed varied, but are not being met. I think that education about the issues affecting families in our district, whether it be substance abuse or lack of educational opportunities, etc., need to be consistently addressed and have experts and professionals coming in to the community on a regular basis to share how the constituents can improve their quality of life. I have been building a relationship with the PA Budget and Policy center for help with understanding the machinations of the budget process and how to effectively fund issues that are priorities to me. I feel that this organization aligns with many of the policies that I feel are important to myself, my district and for Pennsylvania. Many of the policies that I would deem a priority are: Public Education, Mental Health and Substance Abuse Funding, Environmental regulations, Infrastructure issues and Fair Taxation. I feel it is time that we build support in both houses of the legislature to legalize recreation use of marijuana. Although I do not personally benefit from this, I feel that our society is perfectly comfortable selling and taxing alcohol, which is much more deadly in my opinion. I feel that one of my strengths is being amiable with many different people, especially those who may not agree with me. Building relationships with bipartisan colleagues is something I greatly look forward to doing. I am one of that 75%. I believe that we need to work together with all unions to create a curriculum in the public school system that prepares students to work in a wide and varied array of trades and public service sectors. General curriculum is important, however preparing our youth to become contributors to our society that mutually benefits us all should be everyone’s priority. I believe that we can help solve many different problems with this approach. I firmly believe that our county and our State and City, has a shortage of mental health therapists and professionals. I thinkt that implementing plans that may entice people with partial degrees, or people looking to change their career path should receive incentives of reducing or eliminating debt by encouraging them to go back to school to receive supplemental degrees or certifications that would qualify them, and then in turn reducing their overall debt over time. I believe we now have the opportunity to take back our schools from special interests and for profit corps with the new school board. I believe the new school board should make it a priority to stop the expansion and ensure that the rules and regulations to operate any new schools are on par with the same regulations as our public schools are held to. ESAs and vouchers are just poisoning the well of education, which is a public good, and making it easier for our capitalistic society to commoditize our schools and our students. I think public schools are extremely important to our children’s future and we are in a time where we can make the city and school board accountable to advocate on behalf of the students and teachers. I believe making it easier to organize across all industries is vital to sustaining a strong and healthy middle class and democracy. If we allow the corporations to dictate everything our workers suffer. I would advocate against right-to-work legislation and any legislation that would adversely affect workers and their rights to unionize. I would encourage organizing in industries that are currently not represented and create a commission to work with unions across the board to identify sectors that are not represented and formalize processes to engage with other representatives in the area to hold informational sessions regularly to educate those employees of the necessity for unionizing and the power unionizing has. Unequivocally YES. I believe working with the mayor and other government entities to bring class action suits against the pharmaceutical companies to hold them accountable in the court of law for creating the current crisis we are in. I believe that minority and immigrant communities are unfairly targeted by law enforcement and we must be supportive and ever watchful of their efforts to threaten those communities. We need to do more in higher crime areas to educate those who are affected by violent crime that they are not alone. We should mass organize in those neighborhoods like we do when Mike Pence comes to town. Maybe the kids in those adversely affected neighborhoods would come to understand that it isn’t OK to perpetuate a violent way of life and that there is a way of love and compassion. 12. Do you agree or disagree that “tough on crime” policies have overcrowded our prisons, and if so, what steps would you take to reduce our prison population? Agree. I believe that the current DA is stemming the tide a bit, but having more interaction with volunteers in the prison system would be helpful. Promoting new efforts of engagement with those in prison would be a very good start to help those currently in prison transition out of prison and let them know that being in prison will not mark you for life. I would support legislation to provide universal child and elder care. I firmly and solemnly believe that every public servant should serve first and foremost children, the sick and the elderly. If we can’t help those and their families, then we are certainly not serving in the public’s interest. Yes, I agree with having a universal federal or state funded program that provides equal and equitable access to all people in the United States, regardless of documentation status. I also believe it should be comprehensive, free at the point of service and provide transitioning for those currently employed by the for-profit system in place. I had the opportunity to discuss this with the head of the PIDC today. I do believe that this, (after having more time to discuss this first hand and do more research on the subject) is designed to benefit big business only. It has also been proven that there is no objective way to measure the effectiveness of this program. I believe it is time to phase out this program or limit it’s use. I feel that businesses have just gotten a huge tax break in December of 2018. I was arrested for trying to stop the tax scam. I believe that they are not entitled to any more welfare from the state. I do not feel it is wise to privatize any public good or infrastructure that benefits all people. It just pushes us even further into a capitalized system that is oppressive and non-human. Industrial pollution, the oil and gas industry, de-regulation, etc. The current stripping of effectiveness of the EPA… Many different threats and causes and now even more. If we do not stand up to the industries that cause this we will never see an end. I would like to support Rep. Rabb’s bill that would transition our state to 100% renewable energy by 2050 and encourage the city and commercial and industrial businesses in the city to do it even faster by promoting and supporting SB 234. Disagree. I went to Houston to volunteer after Hurricane Harvey and saw first-hand the devastation caused by being a “energy hub”. I will tirelessly advocate for renewable energy in Pennsylvania. No.